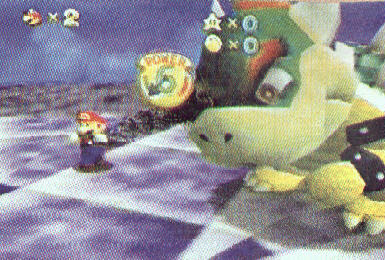 My online stumbling has led me to Unseen 64, a truly righteous site that compiles images from beta versions of famous video games. Sure, half the text is in Italian, but that shouldn't stop you from taking a look. After all, doesn't Mario speak Italian? 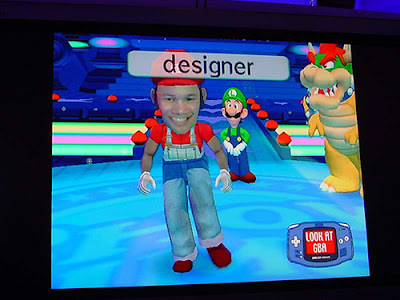 Screenshots from not-ready-for-prime-time versions of various Mario games are always a trip, as any true gamer can't help marvel at what could have been. First up, Super Mario 64. Not too much here, besides a slightly different looking Bowser and a primitive power meter. 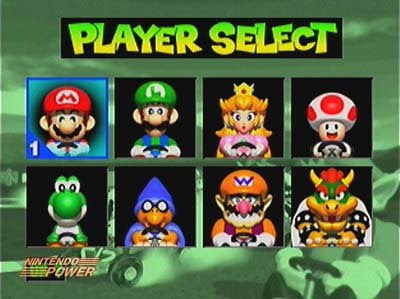 Next: Mario Kart 64, or as it was known in pre-production, Mario Kart R. I'd nearly forgotten that the original line-up for the game included Kamek — or, possibly, a generic Magikoopa — at the expense of the Donkey Kong County-modeled D.K. In a sense, I suppose this character was an upgrade from the playable Koopa Troopa in the first Mario Kart. Also changed: the portraits of the top four spots are staring straight ahead instead of to the side. Originally, the first sequel to Super Mario RPG was fittingly titled Mario RPG 2. 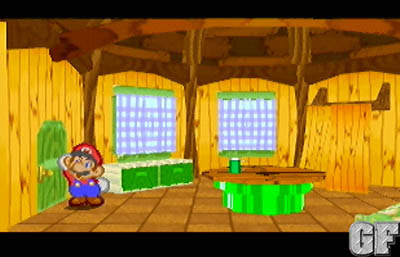 Note that the Mario depicted in these early screenshots isn't the 2-D wonder we came to know and love in Paper Mario. He's cartoonier, with bigger eyes. 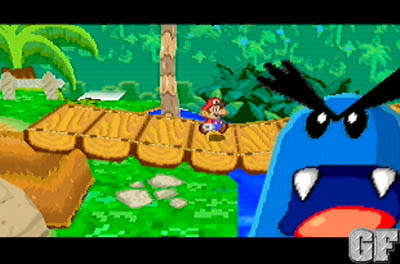 Of note, the original game seemed more populated by characters from Yoshi's Island, including Poochy the dog and Nep-Enut, the big blue water monster. And see the "GF" watermark in the corner of these? I'm guessing that means they were initially property of the now-defunct Diehard Gamefan magazine, which was one of the better gaming publications ever put to print. The differences between the beta version of Luigi's Mansion and the final version basically amount to a few cosmetic changes, the site notes. 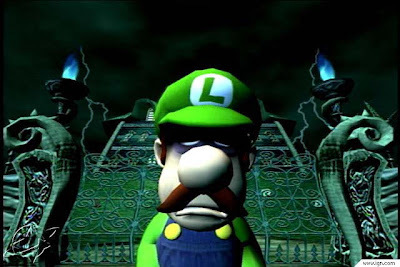 For example, check out the way cartoony take on dejected Luigi outside the mansion. 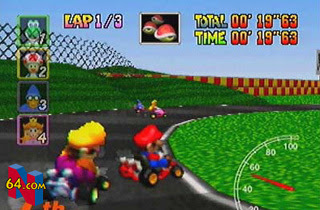 A canceled title for the Nintendo 64DD that was later pushed to the Gamecube before its second cacellation, Stage Debut used an superevolved version of the Game Boy Camera to put the player's face on in-game action. I'm not sure exactly what kind of action that would have been, but this article theorizes that some of the ideas that never came into fruition for Stage Debut may have been reconstituted for various Mii Channel functions. 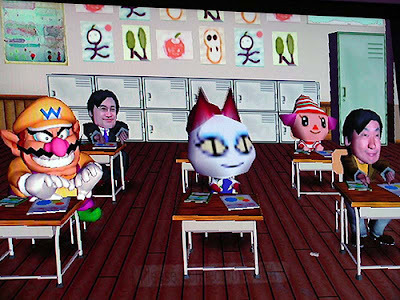 As you can see, Mario characters showed up alongside Nintendo executives and folks from Animal Crossing and Pikmin. And then they all danced together. 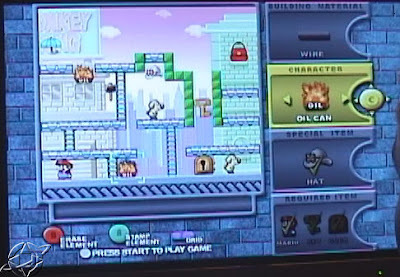 The below screenshot represents all that came of a proposed sequel to Donkey Kong '94, which itself was an update the original Donkey Kong gameplay. 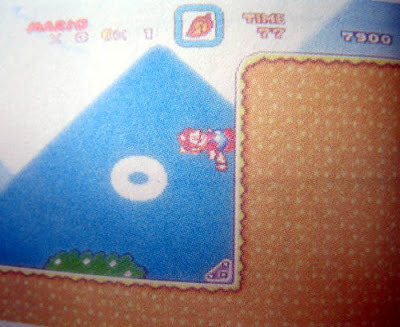 Apparently the game would have included a mode in which players could compose their own stages to send Mario through. Sound cool — though apparently not cool enough to get the game actually made. 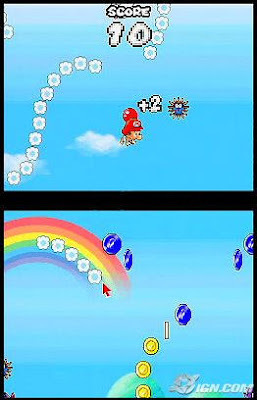 I know very little about Balloon Trip, the working title for the game that eventually become Yoshi Touch & Go. But here are some screens all the same. 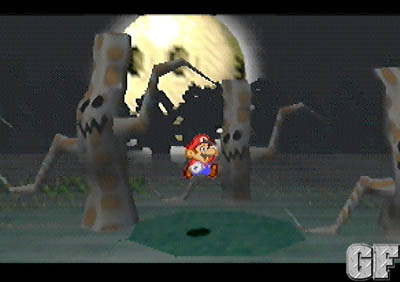 As The Mushroom Kingdom noted in one of their "Lost Bytes" specials, creators of Yoshi's Island initially envisioned three additional transformations for the title character: a propeller plane, a tree and a mushroom. The plane? That makes sense. The other two, though — I can't imagine how they would have worked in the game. And finally, the biggest surprise of all: Super Mario World. The screenshots below must have been from a markedly early version of the game, as they little resemble the Super NES launch title we've all come to know and love. 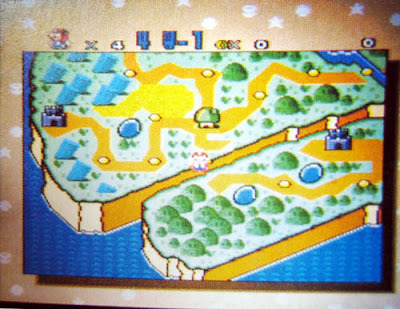 The map screen seems to be more inspired by Super Mario Bros. 3 than the final product was. Note the Toad Houses dotting the landscape. 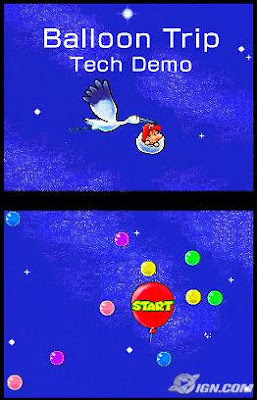 You won't see them in Super Mario World. 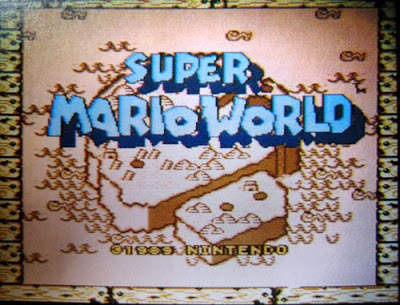 It's simplified, and a lot smaller looking, if the brown-scale map shown in the title screen is any indication. Another huge change would be the presence of the Raccoon Leaf and corresponding ears and tail. 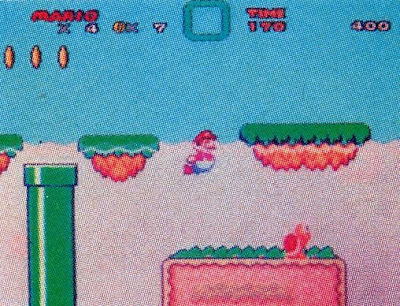 I'd guess the programmers eventually decided to switch out this Super Mario Bros. 3 power-up for the Super Cape, which allowed Mario better control in the air. See the Koopa Troopa? If you'll remember, Super Mario World marked the first game in which these turtle baddies walked on their hind legs. I wonder what prompted the change. 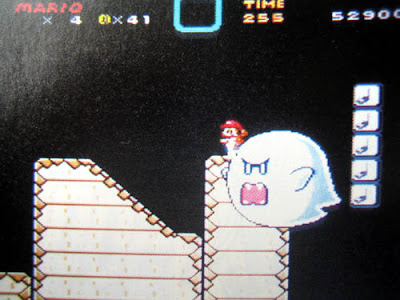 Another Super Mario Bros. 3 remnant: the bouncy note blocks, seen in the below screen of The Big Boo. So they did. Random. I'd forgotten until now. Odd that they would have stuck them in so few places, no? You know, they also have beta pictures of Super Mario Sunshine. Apparently, humans were supposed to be in the game, but this got scrapped. Anonymous: That I did not know. 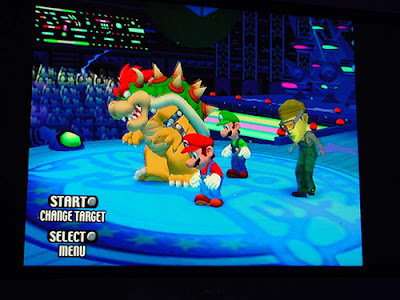 Do you have any idea where I can find these Super Mario Sunshine beta photos? 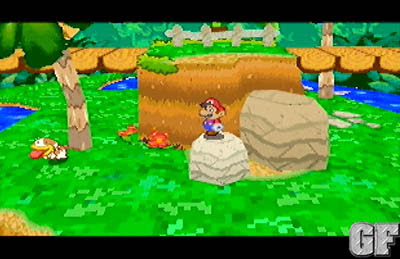 http://www.mariowiki.com/images/5/51/Beta.jpg It's a bit blurry but here's a screenshot of a human in the Sunshine beta.